Tucked away in central Louisiana are unique herds of wild horses. A vision that removes you from all attachment to the outside world. Today their existence is under attack. Even as I am writing this I am receiving word that yet another lot of horses has been captured and is currently in holding on the Fort Polk Installation. The officials involved continue to ramp up capture intervals at a rate that ensures the horses end up going to slaughter. Federal Grant Money was issued by Army Corps of Engineers for “cultural resource management” in the spirit of Historic Preservation, sadly it was used to destroy the very thing it was intended to protect, Our History! All this occurring on the watch of the Fort Polk Installation and Dr Todd Ahlman, Director of the Center for Archaeological Studies at Texas State University. The Cooperative Agreement is titled, “Horse Capture and Maintenance“, which tends to imply protection, maintenance, and welfare as opposed to mass elimination, which has been the intention of the Army all along, as seen by the Army’s 2016 Environmental Assessment. Could ACE have been misled by officials in the installation’s civilian led Range Control and Environmental Division? Could the same have happened with Texas State University being encouraged to subcontract the local criminal kill buyers for round up, known as Jacob Thompson Cattle Co aka Thompson Horse Lot, who is the subject of several investigations. It begs the question how did the likes of the Thompson’s get connected with a TSU Director of Anthropology? In addition, how does a shadow organization (Meridian Falls Ranch) with a history of livestock related convictions and other criminal charges get clearance to obtain horses through what is implied to be the “rescue phase” of the Armys plan to “eliminate” these wild horses? This is a blatant misuse of funds and at the very least morally wrong. Its criminal to allow this plan to continue without first considering the potential effects on the welfare of the horses, considering the potential effects on the cultural landscape per section 106 of the National Historic Preservation Act, without a complete Environmental Impact Statement, without finding sanctuary land with Kisatchie’s 604,000 acres. 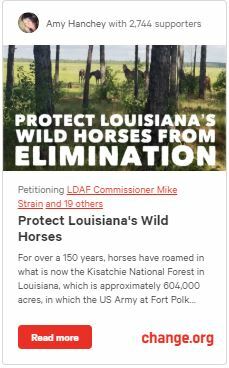 $100k of federal grant money paid to kill buyers would have been an amazing start to protecting and preserving the herds of culturally, historically, and genetically significant wild horses of Louisiana. Read more on the historical, cultural and genetic significance of Louisiana’s Wild Horses. There should be organizations directly involved whose sole purpose is to protect and preserve the welfare of Louisiana’s Wild Horses. As of August 14, 2018 we have received two responses. One from Dr Todd Ahlman of TSU and the other from John Walther of LDAF. Not one Federal or State entity is taking the initiative to help the horses, the Army is making it impossible for ethical organizations to help. Bulldozing through this in a barbaric inhumane way, stacking the deck against the horses. Over the last 3 years we have witnessed inhumane acts such as horses being illegally tranquilized and winched into trailers, inadequate capture and holding practices, free for all round ups that resulted in harm to the horses, roping of foals, foals being captured without their mothers, and a long list of alleged under-the -table dealings at the detriment of the horses. It sure does appear that any entity who truly cares for these animals is receiving completely different treatment than entities whose goal is to profit off of the destruction of Louisiana’s unique Wild and Free Roaming horses. There should be a better set of solutions available, that may, in the end, include a mix of finding good adopters for some horses, non- permanent fertility control for others, and remain in place for yet others, along with some herd control measures to keep horses away from sensitive areas of the fort property. But the only way to find the best solutions is to engage in honest and open consultation with as many experienced humane organizations, equine welfare organizations and experts, as well as local stakeholders. We do not want this to continue without first fully and ethically considering the potential effects on the welfare of the horses, as well as the potential effects on the cultural landscape per section 106 of the National Historic Preservation Act, a complete Environmental Impact Statement, work to find sanctuary with Kisatchie’s 604,000 acres and there should be an organization included whose sole purpose is to protect the welfare of these animals. 05/2018 RoundUp#5 FRRR/BGVT/SLPAC/MFR — 37 Horses: 18 saved by SLPAC, 6 saved by BGVT, 1 saved by FRRR. Remaining 12 which were primarily studs were taken by MFR even though we had placement … they took then and we never heard another word until I received a report that they went to Elkhart auction. 06/2018 RoundUp#6 MFR — 32 Horses: Seemingly disappeared into thin air. It it suspected they also went through the same auction. 07/2018 RoundUp#7 MFR to THL — 33 Horses: Within 3 to 4 days of initial notification 28 of the 33 went to THL. Initially THL wasn’t admitting they had the 4 studs and only advertised the 23/24 in that video. unknown where the missing 5 went. With out the donor and Freedom Reins those horses would have shipped without a doubt. 08/17/2018 RoundUp#8 — 32 Horses are currently in holding on the Fort Polk Installation.